Analysts have had a variety of expectations for dividend stocks in 2014. When equity markets were most volatile, some investors viewed these stocks as more defensive holdings. As interest rates dropped, they continued to be attractive income sources for yield-seeking investors. But as stock prices rose, some analysts wondered if they could be overvalued. Despite the background noise, dividend-stock investors have benefitted from their holdings, as the overall level of dividend payments continued to increase throughout the year: Dividends per share grew 11.5% for the S&P 500 stocks over the trailing 12-month period ending in July, according to FactSet Research System’s “Dividend Quarterly” report of Sept. 15, 2014. Dividends convey valuable information about how executives view a company’s financial condition and outlook. Regular dividends demonstrate solid financial health and sound management. Because dividends require cash, companies that are struggling to maintain cash flow can’t risk committing to regular payouts. Companies that consistently raise dividends are expressing confidence in their business outlook. A policy of sustainable and growing dividends shows that management is keeping its focus on creating wealth for shareholders. Dividends also impose capital discipline on management, says Job Curtis, head of value and income at Henderson Global Investors in London. While some capital expenditures certainly benefit long-term growth potential, companies can get carried away with capital expenditures and potential acquisitions when business is good, he believes. Every company must balance competing demands on its free cash flow, which can be used internally, paid out as dividends or used to buy back shares. For instance, Questar Corporation in Salt Lake City, Utah, sets three priorities for its free cash flow, according to Tony Ivins, vice president of investor relations and corporate treasurer. The first priority for Questar is investing internally in sustainable earnings and cash-flow generating growth projects. The second priority is to grow the company’s dividend at roughly the same pace as earnings growth. The final priority is returning capital to shareholders in the form of share repurchases. “Regarding any potential large-scale share repurchase programs, we would prefer to invest internally to grow both earnings and earnings per share, not just EPS via a buyback program,” Ivins explained. At CMS Energy in Jackson, Michigan, the company attempts to balance its focus on both customers and investors, according to Phillip J. McAndrews, director of investor relations. It’s easy to overlook dividends during bull markets, but that viewpoint minimizes the historical contribution of dividends to total returns. According to a 2014 report from Santa Barbara Asset Management, dividend income comprised 42% of the S&P 500′s total return from 1926 through 2013. There’s a wide variation behind that number, of course, experts say. During some decades, such as the 1940s and 1970s, dividends comprised more than half of the index’s total return. In the 1990s and for 2010 through 2013, however, the contribution was 15% and 14%, respectively. Dividends also play an important role in other nations’ equity-market returns, Curtis points out. In some markets, such as that of the United Kingdom, the contribution of dividends is higher than it is in the United States; in Germany, it is similar to that of the United States, and in Japan, it is lower. Retail investors often suffer from poor market timing — they buy high and sell low. Earning dividends can alter that behavior for several reasons, says Mike Boyle, CFA, executive vice president and head of asset management with Advisors Asset Management in Lisle, Illinois. Plus, dividend-focused strategies generally have lower volatility than non-dividend paying stocks, Boyle notes. That reduced volatility can help investors stay the course and remain invested when markets weaken. Receiving income also influences behavior, whether investors retain or reinvest the income. Investors earning current income tend to be more patient. In a sense, they’re getting paid to wait for the next market rally. “I think they are afforded the luxury of being a little more patient, which keeps them invested,” he said. It remains a challenging environment for income investors. The widely anticipated rise in U.S. interest rates hasn’t materialized yet, and slow global growth means that foreign fixed-income yields aren’t likely to increase soon, either. Dividends can meet the need for income growth. Although the S&P 500′s yield is currently below 2%, payouts of the component stocks can increase over time. Over a 45-year period, the average growth rate for the dividends of companies in the S&P 500 has been 6.2%, according to Boyle. The rate of growth has been higher lately, as companies have recovered from the financial crisis: The year-over-year increase is about 11% through November 2014. This growth rate is likely to revert back to the historical average eventually, though he’s optimistic about near-term prospects: “I think we’ll probably stay in the high single-digits, right around 10% over the next 12 to 24 months,” Boyle said. The higher-income trend for totalreturn investors differs dramatically from bond investors’ experience in recent decades. A 2014 analysis by Fayez Sarofim & Company compared income payments generated by the S&P 500 stocks and by the Barclays U.S. Aggregate Bond Index from 1979 through 2013. The difference is striking. “The S&P 500′s annual dividend income from a $100,000 investment grew from $5,234 to $32,416 vs. an actual decline in annual bond income received [to $2,998] from the Barclays index over the same period,” the group reported. In fairness, the lower interest rates that dominated the period generated capital gains for bond investors, but the S&P 500 Index also rose substantially over the same years. Dividend increases require deliberate decisions by companies’ boards, and these decisions are often supported by long-term financial strategies. 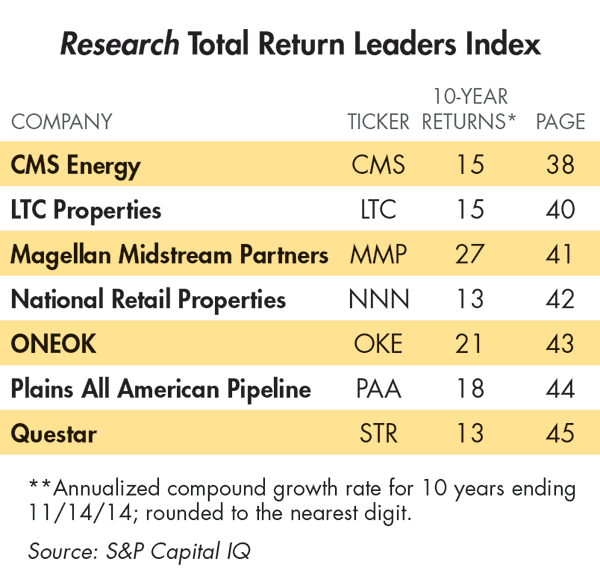 CMS Energy plans to grow dividends in line with earnings, resulting in a total shareowner return of 9% to 11% each year, according to McAndrews. In the utilities sector, he explains, the growth of earnings per share and increases in dividends are driven by capital investment, about 50% of which is equity based. Questar Corporation also aims for dividend growth, and changes to the company’s business have influenced its payout policies. After Questar’s 2010 reorganization and the spinoff of its exploration and production businesses, the company needed to rapidly grow its dividend level, both yields and payouts, to be competitive with its gas utility peers, says Ivins. Consequently, Questar has raised the dividend rate nearly 50% since 2010 to an initial target dividend payout level of 60%. The target level is not necessarily a cap, but rather a guideline that the actual payout should be at or near, Ivins adds. “Questar’s management focuses as much on the retention ratio as on the payout ratio in order to make sure enough capital is retained to fund growth projects,” he said. “Dividend growth going forward should be roughly in line with earnings growth,” which is in the 4-6% range. A company’s structure also influences its dividend policy and expansion. Pam Kessler, executive vice president and chief financial officer with the real estate investment trust LTC Properties, Inc., of Westlake Village, California, says that as a REIT, the company must pay out at least 90% of its pretax earnings in the form of dividends to shareholders. Given that constraint, the company averages a payout ratio of 80%, which is slightly more conservative that its peers. “We generate most of our growth externally, through new investments in senior housing or skilled nursing properties, and because we don’t retain much internally generated cash for investments, we rely on the debt and equity capital markets to fund our external growth,” Kessler said. Of course, dividends aren’t guaranteed, and a dividend cut or suspension can be very costly for shareholders. Thus, dividend safety is “absolutely priority one”, says Josh Peters, CFA, editor of Morningstar’s “Dividend Investor” newsletter. Cuts have two impacts, he explains: Investors don’t receive the income they had expected; in addition, they’re likely to lose a significant amount of capital. Historical results demonstrate how markets support dividend growers and initiators but punish dividend cutters and eliminators. According to Santa Barbara Asset Management’s analysis from Jan. 3, 1972, through year-end 2013, companies in the S&P 500 that grew or initiated dividends had annualized total returns of 10% with an annualized standard deviation of about 16%. In contrast, dividend cutters or eliminators had returns that were close to zero with standard deviations above 25% for the same period. Investors should keep the safety-first principle in mind when evaluating stocks, Peters cautions. Peters considers multiple factors when assessing the stability of a dividend. For instance, does the business produce wide swings in earnings that make it harder to predict if the company will have the resources to pay the dividend? Heavy debt loads that burden cash flow that otherwise could be used for dividends are another negative factor. Also, the payout ratio is an important criterion. Investors recognize the value of dividend growth and safety and are usually willing to pay for those attributes, particularly during volatile times. That willingness has led to a strong performance from dividend stocks and subsequent comments from some market observers that the stocks in general are overvalued. Is that an accurate assessment? Boyle doesn’t think so. As of late-November 2014, the S&P 500′s price-earnings (or P/E) ratio was slightly over 18. Both the 10-year and 60-year averages were closer to about 16.5, so he agrees there was a slight overextension by that gauge. “The most recent year-over-year consumer price index [figure] that came out was 1.7, so call it 18 and change, plus 1.7, and you’re still at or below 20. And we’re expecting earnings to grow about 11% year over year,” said Boyle. Peters agrees with the consensus view that there are very few bargains and that some dividend stocks look like they’re slightly overpriced. It’s all relative, however, he emphasizes, and most investors generally want to invest their money. The argument for sticking with dividend stocks applies internationally, too, says Curtis. Global interest rates remain at exceptionally low levels, and 10-year government bond rates in other countries are below the U.S. rate. Those low rates make a strong case for buying healthy companies with attractive dividends.